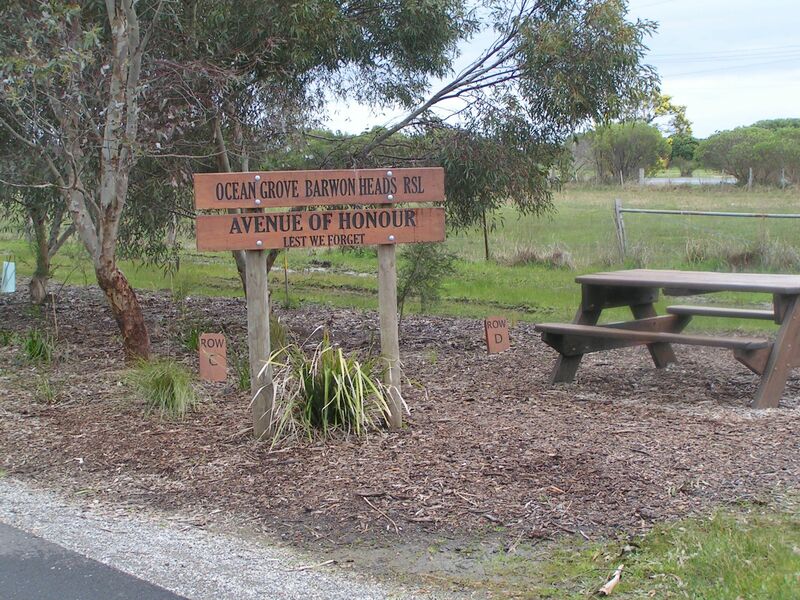 The Ocean Grove Avenue of Honour began from a meeting with City of Greater Geelong in 2002 requesting a portion of the Rail Trail to start an Avenue of Honour for our deceased members. A volunteer group named “The Friends of the Bellarine Rail Trail” had recently formed with plans to completely revegetating with native vegetation the pathway that stretches from Geelong to Queenscliff along the old train line. 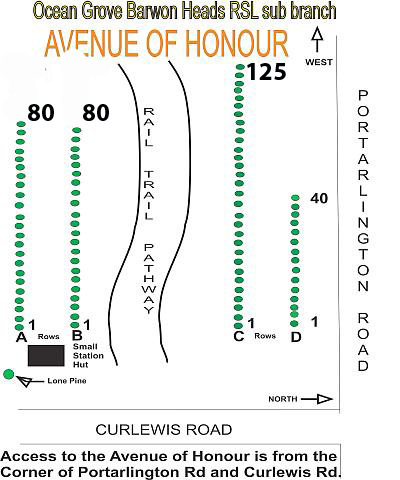 It was agreed that a section just before Curlewis Rd – Bellarine Hwy intersection would be ideal and since then volunteer workers ( made up of mostly seniors )from “The Friends of the Rail Trail” have planted well in excess of 200 Yellow Box Gums. Suitable signage clearly marks the area, and is a fitting tribute to each of our Ex Service members to whom on their death are each designated a tree. A Gallipoli Pine was added at the entrance of the avenue on the 15th April 2011 as a further tribute to the men and women who gave their lives for their country. Our thanks go to those members of the “Friends of the Rail Trail” who for the last ten years have maintained not only our Avenue of Honour but the whole of the rail trail in making it one of the “Wonders of the Bellarine”.